Forward-thinking regions across the country are grappling with how to achieve more inclusive economies. Part of the work rests on better measuring the progress communities wish to see. One year ago, the Fund for Our Economic Future released The Two Tomorrowsreport, which asserted a purposeful path to an inclusive, regenerative economy. The narrative was shaped in part by exploring what Northeast Ohio could be like — what it would feel like — if it had sustained, long-term economic growth, where residents from all corners of the region earned meaningful wages at meaningful jobs, and had access to those jobs regardless of their race or ZIP code. The Two Tomorrows report included a Growth & Opportunity Scorecard, with eight load-bearing metrics — including traded-sector growth and economic security — that showed where the region currently stands and what needs to happen to realize this vision. It also benchmarked Northeast Ohio against 10 peer economies that share similar geography, size or industrial heritage. Traditional measures of economic success – job gains, gross product and per capita income – imply that work to address economic opportunity is additive, not co-equal. “We wanted to develop a holistic picture of how the regional economy is doing, one that not only reflects our global competitiveness, but also how that translates into the lives of the citizens of this community,” said Brad Whitehead, president of the Fund. "Most metrics don’t differentiate between jobs —any job is considered a good job — nor whether gains are shared. We wanted to put people at the center of our assessment." The Fund consulted local and national experts when considering which metrics appropriately reflected its vision of success. Now, the Fund is releasing its 2019 scorecard, which reflects some improvement in certain areas. The disparities reflected in other metrics underscore the urgent need for collective action. “The philosophy of having a scorecard for the region is about the importance of measuring growth and opportunity, but also about the importance of collectively holding ourselves accountable as a region,” said Janine Spadafore Kaiser, director of job preparation at the Fund, who supported the data analysis for the scorecard update. The good news shows the region is closing in on the Fund’s target for full employment, with Cleveland and Canton exceeding the goal. Growth in traded-sector gross metropolitan product showed some moderate improvement, as did the growth of young firms. But these economic indicators alone cannot buoy a regenerative economy, Burke said. Monitoring the change in economic security is key in determining whether the economy is generating enough good jobs and rising incomes that enable families to, at the very least, earn enough money to cover their basic expenses. Only 58% of families in Northeast Ohio are meeting the basic living wage threshold required to pay for things such as child care and health care. The metrics of employment equity, income equity and geographic equity support this position. The share of economic prosperity is disparate, and tilted in favor of whites. Currently, the unemployment rate is 8.2 percentage points higher for black Northeast Ohio residents than white residents. White workers are earning $1,500 more per month than black workers — a slight improvement from the prior performance period, but still an unacceptable reality. As such, eliminating the number of people living in concentrated poverty is a top priority. This benchmark emphasizes how essential a unified regional approach is to providing access to job opportunities regardless of race or place. The continued momentum of the region’s biomedical industry dovetails with the scorecard’s storylines and is a harbinger for more forward movement. High-profile company exits and big acquirers putting down roots position the region as supportive to entrepreneurs. Meanwhile, a record number of local health care companies raised $218 million in growth capital in 2017. These realities are the culmination of commitments from higher education institutions, companies, Ohio Third Frontier and other business attraction and investment efforts, said Aram Nerpouni, president of BioEnterprise, a Fund job creation grantee partner. “We are 15 years into a very deliberate coordinated state and regional effort to invest in the health care and bioscience space, which has global notoriety,” he said. However, the persistent talent crunch continues to hamper the industry’s full potential, he said. While efforts to recruit talent from beyond our region’s borders remain a legitimate priority, more focus should be directed at filling the pipeline with people from all pockets of the community. The formation in 2016 of HIT in the CLE is helping facilitate that imperative. HIT in the CLE represents a collaborative of companies and educational institutions aimed at growing and diversifying the talent pipeline and availability of highly skilled health IT talent. The initiative focuses on educating students in Cuyahoga County, particularly within inner-ring Cleveland schools, in two critical health IT positions — software developer and data scientist. The collaborative outlines the coursework and skills that students need to learn early on to eventually acquire a job in that field, which can pay in the $60s, $70s or even $80,000-a-year range. “There’s a vested interest in engaging the student population in Cleveland in computer science,” said Grady Burrows, director of Health IT Talent at BioEnterprise. That entity also hosts weekly computer science courses at the Global Center for Health Innovation for Ginn Academy, Collinwood High, East Tech and Jane Addams students. Cleveland’s recent designation as a Say Yes to Education city also represents a community-wide commitment to boost high school and college graduation rates for inner-city youth, ultimately bolstering the region’s talent pipeline and workforce development efforts. 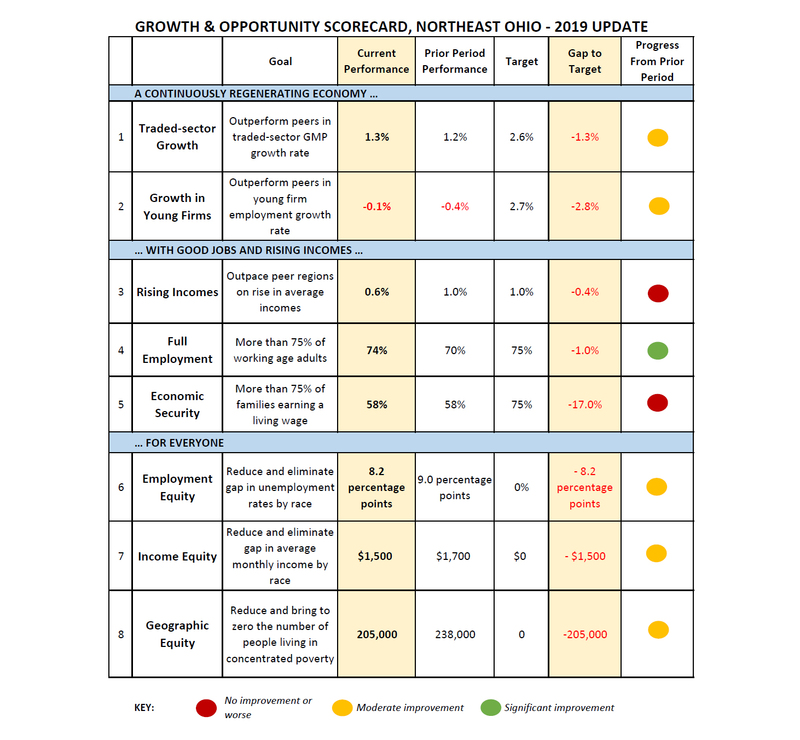 Editor’s note: The 2019 scorecard reflects the Fund's analysis using data from the Census Bureau, Bureau of Labor Statistics, Moody's Analytics, EMSI and the United Way. Due to availability of data, underlying data for the traded-sector GMP indicator shifted from Bureau of Economic Analysis in the 2018 scorecard to Moody's Analytics. The source of the rising income indicator switched from Brookings Institution’s Prosperity Index to the Census Bureau’s Quarterly Workforce Indicators. The source of the economic security analysis shifted from Brookings Institution's Struggling Families analysis to the United Way's ALICE (Asset Limited, Income Constrained, Employed) indicator. Figures for metrics 1-3 represent 5-year compound annual growth rates from 2012-2017; metric 4 reflects 2018 data; metric 5 reflects 2016 data; metrics 6-8 reflect 2017 data. Target for metrics 1-3 is based on peer MSA performance during same time period. Peer regions are Baltimore, Cincinnati, Columbus, Detroit, Indianapolis, Louisville, Milwaukee, Minneapolis, Pittsburgh, and St. Louis. Target for metrics 4-8 is based on reaching a target goal for the metric, independent of peer metro performance. In the progress from prior period column, green denotes improvement in both trend and gap; yellow denotes modest improvement; and red denotes no change or worse performance. In partnership with Crain Content Studio-Cleveland, the Fund for Our Economic Future will illustrate through a series of custom reports published between November 2018 and April 2019 the positive momentum, benchmarks and work yet to be done as it relates to TheTwo Tomorrows report. All of the content will be available at www.CrainsCleveland.com/TwoTomorrows. New stories will be available the second Monday of each month through March, as well as on April 15.